2) Only 3 out of the last 10 months, did Olam closed higher for the month. 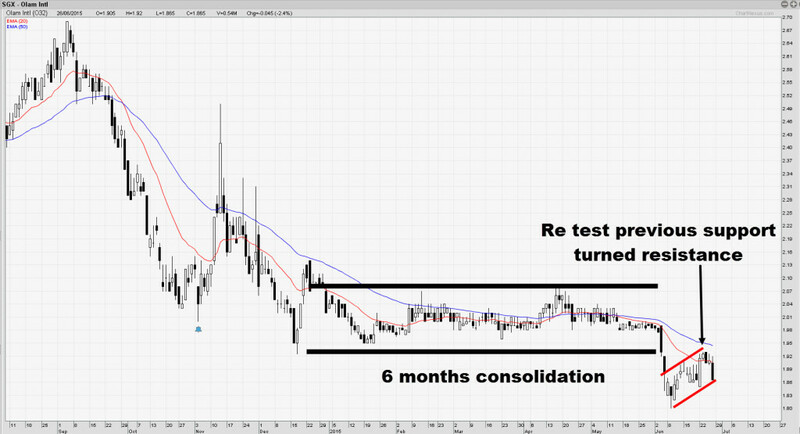 3) Price consolidated for 6 months and finally broke down on 5/6/2015. 4) Price was rejected from the previous support turned resistance. 5) 52 week low is currently at $1.80. 6) Price rebounded from the 52 week low which should have gathered some long interest. There could be resting stop orders just below the 52 week low, from traders who went long after the rebound. It will be a bearish flag pattern if price trades below the recent swing low. I will look to short 1 tick below, with stop loss of 2 ATR.